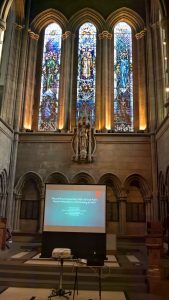 Our research assistant Anna McFarlane gave a talk today as part of the University of Glasgow’s War and Medicine Lunchtime Talks series entitled “‘Becoming Acquainted With All That Pain’: Naomi Mitchison’s VAD Nursing in WW1”. Due to popular demand on our Facebook group you can listen to the talk here, or you can download it from Soundcloud. Please excuse the quality of the introduction as the recorder was behind the speaker, the quality of the talk itself is much better. It was delivered in the University’s beautiful memorial chapel, dedicated to those who fell in both World Wars, an appropriate and sobering atmosphere for these discussions. Thanks go to the organisers for putting together the series, you can follow them on Twitter for information about future events, @GlasgowUniWW1. There are two articles mentioned at the end of the talk as examples of further reading. You can find McFarlane’s essay on Mitchison’s You Have Been Warned here and Gavin Miller’s essay on Mitchison’s Memoirs of a Spacewoman here. You might also be interested in Fran Bigman’s essay on interwar women writers (including Mitchison) and pregnancy.